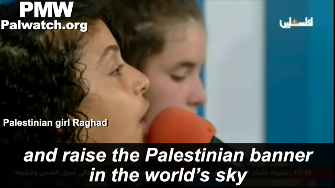 Diario Judío México - The world of hate that the Palestinian Authority creates for its children includes messages of violence against Israel, teaching that Israel has no right to exist and all of Israel is Palestinian, and that Israel’s eventual replacement by “Palestine” is inevitable. 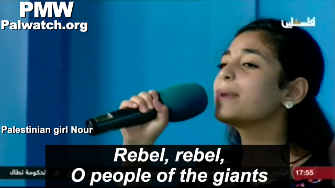 One recent episode of the P.A. TV children’s program The Best Home included all of these messages. For years, P.A. 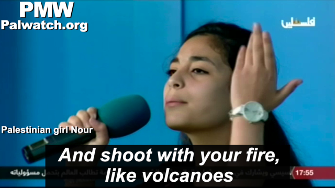 TV has been inviting children to sing this song that urges Palestinians to seek “war” that will “smash and destroy” Israel. 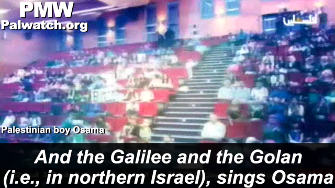 And the Galilee and the Golan (i.e., in northern Israel), sings Osama. 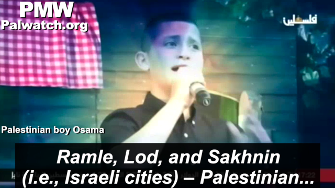 The original song by Muhammad Kabha was aired on May 13, 2011 and has been rebroadcast nearly 200 times on official P.A. TV, P.A. 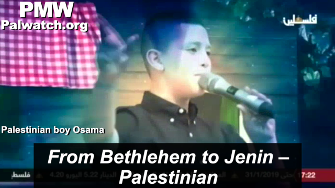 TV Live and Fatah-run Awdah TV, and the boy’s performance has also appeared once before on P.A. TV’s children’s show. 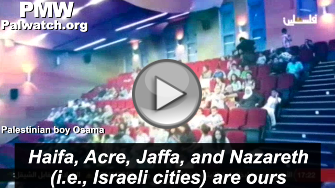 The song misrepresents the following places in Israel as “Palestinian”: Jaffa, Akko, Haifa, Nazareth, the Galilee, the Golan Heights, Lod, Ramle, Jerusalem, Tzfat, Tiberias and Ashkelon. 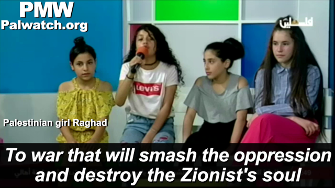 With Palestinian children being brought up in this world of hate, denial of Israel’s right to exist, and violence promotion and glorification of terrorists, it’s no wonder that so many Palestinian terrorists in recent years are teenagers.